A Twitpic user by the name of Brianmarco has posted a shot of an in-store mockup Pre 2 from a Rogers retail store in Canada. 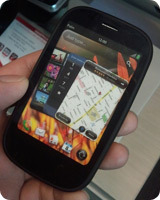 The mockup unit's screen shows the Pre in full multitasking card glory with the new webOS 2.0 style "Just Type" box clearly visible. With no announced plans as yet for Rogers (or any other Canadian carrier) to offer the Pre 2, this is the clearest indicator so far that SFR and Verizon Wireless are about to be joined by another carrier partner. If true, this offering would be the first North American carrier-backed version of the GSM Pre 2 which went on sale in unlocked form to customers in the USA last week. To date, Palm has been rather mum on the issue of Canadian Pre 2 offerings, other than the vague announcement of an unnamed Canadian carrier "in the coming months" promise from last month's Pre 2 press release. If you set your aspiration THAT high, you can only be disappointed. Oh here we go, this is a the thread I was looking for. GSM Pre 2 in Canada, here I come! woohoo!